In microwave bowl melt butter, then whisk in the spices. In a very large mixing bowl combine corn, rice, and wheat Chex, and the mixed nuts. 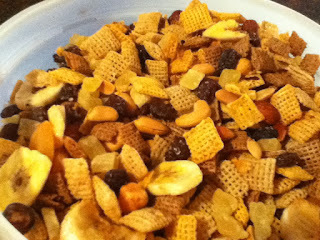 Add the butter mixture to the chex and nuts mixture and coat evenly. Place mixture on sheet pan and cook in the oven for 1 hour, stirring every 15 minutes. After an hour, remove the mix from the oven and let cool. Combine the dried fruit and mix it in with the Chex mix. Store party mix in air tight container.